We are a leading Exporter of beaded african rappers from Chennai, India. These are Highest grade georges which are heavy beaded and can be customized. We make them in our in house workshop where we hand make these designs. You can choose any design from this category and we can make it in all colors which ever you like. 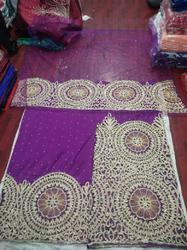 These also come in 5 yards Indian Wrapper with 1.5 yards Blouse. Looking for Beaded African rappers. ?